I’m a fan of NARS, especially their beautiful blushers. I was happy to have been able to get my hands on their Spring 2015 release of the Dual-Intensity Blush in Panic. Featuring NARS’ exclusive Translucent Prismatic Technology, the newly- imagined formula allows for multi-dimensional effects with a uniquely weightless, luxurious texture. Six modern shade pairings curated by Francois Nars offer a universal spectrum of hues that works across all skintones. Sweeps on dry for a bold flush or wet for a translucent wash of color. Dry pigments impart a natural glow that warms the complexion and fuses weightlessly. Dampen NARS’ exclusive Wet/Dry Blush Brush before application for a watercolor effect—dab over the apples of the cheeks and swirl in a circular motion to paint on a subtle tint. The NARS Dual-Intensity Blush Panic is a beautiful blush compact housing two shades of blush: (r) bright pink and (l) golden coral. I like applying the NARS Dual-Intensity Blush in ‘Panic’ with my NARS All Day Luminous Foundation (review) as a base. I first apply the left side (golden coral shade) blended lightly towards my temples, close to my hairline. Following that, I gently swirl the bright pink shade on the right on the apples of my cheeks. Applied dry, the Dual-Intensity Blush ‘Panic’ blends smoothly with ease. I love the beautiful, healthy glow with a flush of color that it provides. These days I prefer a more natural look, and this is exactly what the dry application of Panic provides. However, applying the Dual-Intensity Blush when wet intensifies the pigments and shimmer in the blush, which I do not prefer for myself. The application when wet can also be a bit splotchy. It takes work, and I know that when I’m doing my makeup, I have no time for more work. Overall, I’m a fan of the NARS Dual-Intensity Blush ‘Panic’. It looks amazing on my brown skin, especially when applied dry. During the winter when my skin can look dull, a quick swirl of this blush brightens it right back up! The NARS Dual-Intensity Blush retails for $45, and is available in five additional shades: Adoration, Craving, Fervor, Frenzy, and Jubilation. Have you tried any of the NARS Dual-Intensity Blushers? If so, which, if any, are your favorites? Not too long ago I returned from a seven-day trip to the United Arab Emirates (Abu Dhabi and Dubai), which was a hot and relatively drier climate than where we are now headed – Puerto Vallarta, Mexico. A change in climates and humidity means switching up my skincare needs since Puerto Vallarta during this time of year is not only hot, but also humid. Of course, for this trip I packed my favorite travel-friendly skincare that’s most suitable for the weather I’m going to experience. 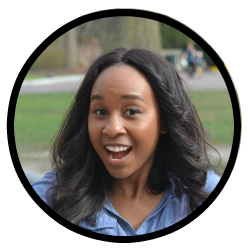 One of the first rules of traveling is being able to pack efficiently; therefore, if I do not have travel-sized items of my favorite products, I siphon them off into travel-sized containers. 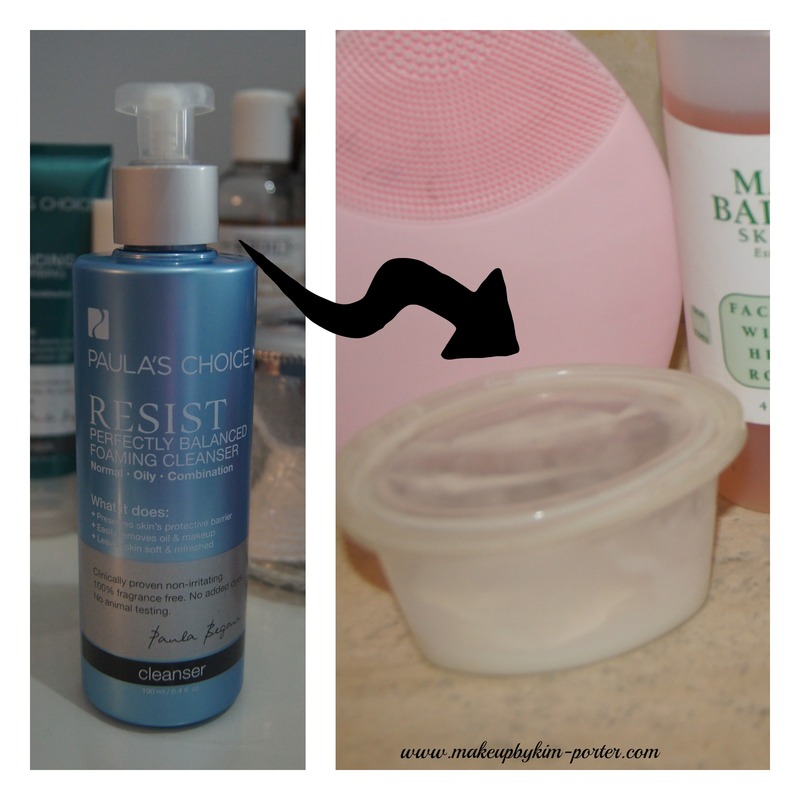 I find the to-go condiment containers to be perfect for cleansers, into which I emptied some of my Paula’s Choice RESIST Foaming Cleanser . 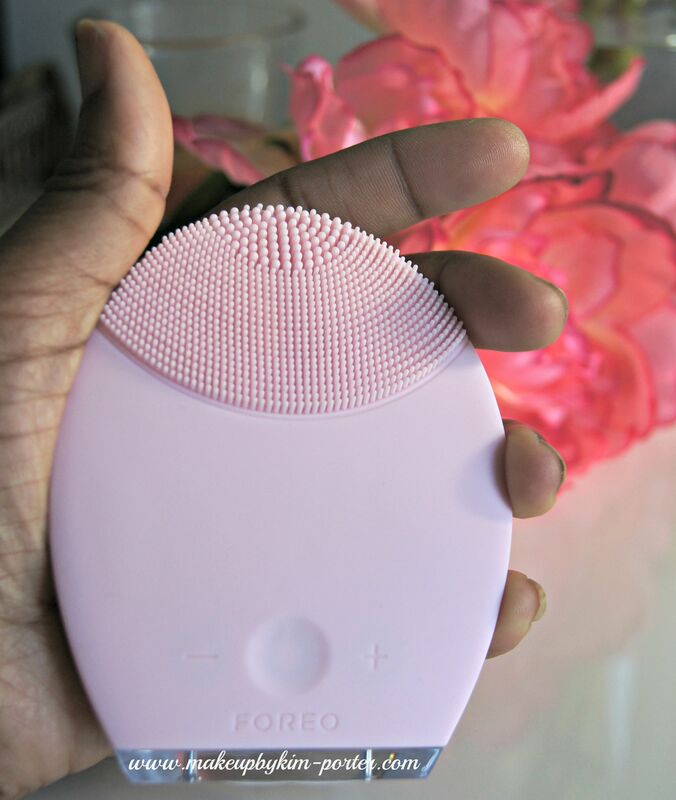 Cleansing your skin is essential regardless of where you are; however, since heat and humidity can lead to more sweat, oil, and dirt, cleansing twice a day with my travel-friendly FOREO Luna is a necessity. The FOREO Luna (review) is gentle enough to use twice per day, and effective in removing the dirt and oil from my skin, thus preventing breakouts/blemishes while I’m away. 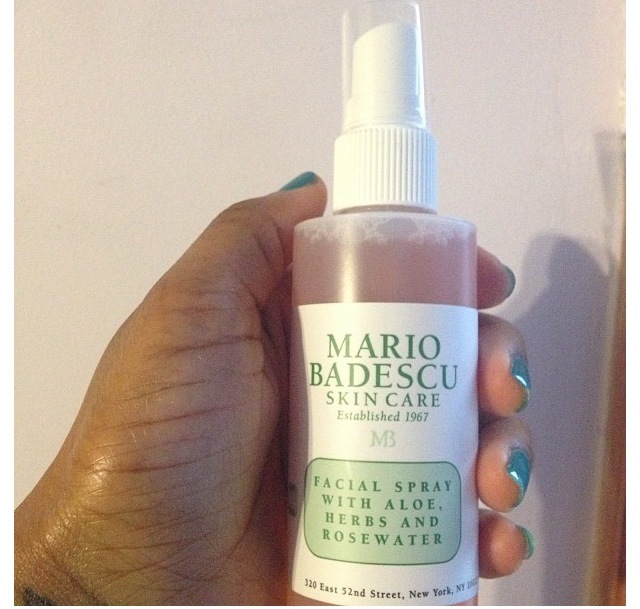 I love, love, love the Mario Badescu Facial Spray with Aloe, Herbs and Rosewater (review). I pack the travel-friendly 4 oz. bottle to refresh and rehydrate my skin post cleansing, and even give my skin a little spray post-moisturizer. 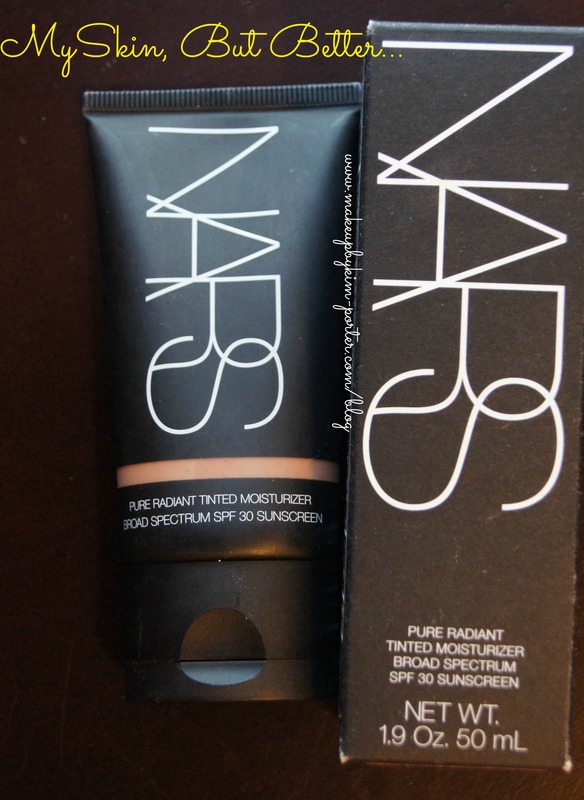 For daytime use when I travel, I’ve packed the NARS Pure Radiant Tinted Moisturizer (Martinique) with SPF 30 (review), and for evening use I bring along Embryolisse Lait-Crème Concentre (review). To the two, I add a few drops of the Paula’s Choice C15 Super Booster. To keep my lips moisturized, I use my go-to lip balm, Carmex! I never leave home without it. Plus, its size makes it travel-friendly. 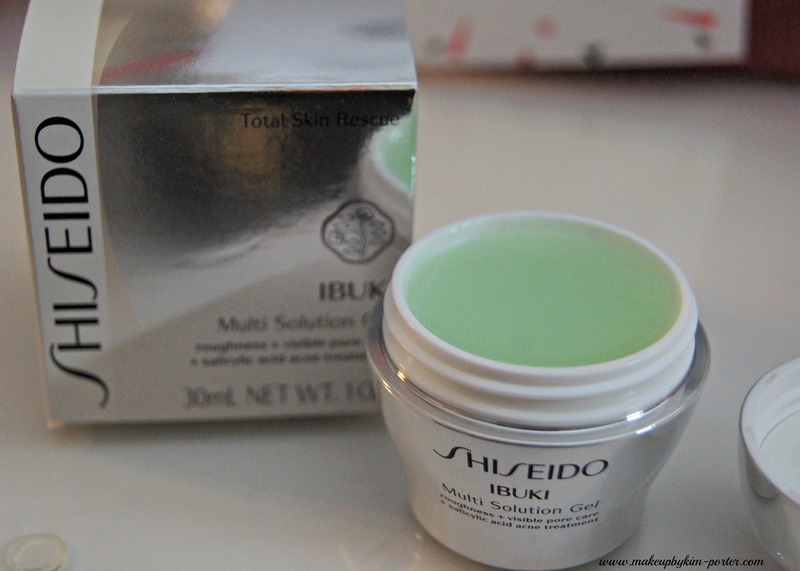 I’ve also packed something new to my skincare regimen, the Shiseido IBUKI Multi-Solution Gel that helps diminish breakouts, roughness, dryness and the look of visible pores. The salicylic acid formula helps aid in oil reduction, getting down into the pores drying up the oil caused by the humidity while also treating the actual bacteria that cause pimples. Even though I can use the gel either under or over makeup, I love using the IBUKI Multi-Solution Gel mostly at night over my moisturizer. Do you have any skin care tips or tricks you rely on for travel? Check out Beauty and the Bump’s Travel Essentials here. Through reading this blog, you’re probably familiar with the Michael Todd brand, especially since I’ve previously reviewed the Michael Todd Soniclear Elite Tangerine Dream. 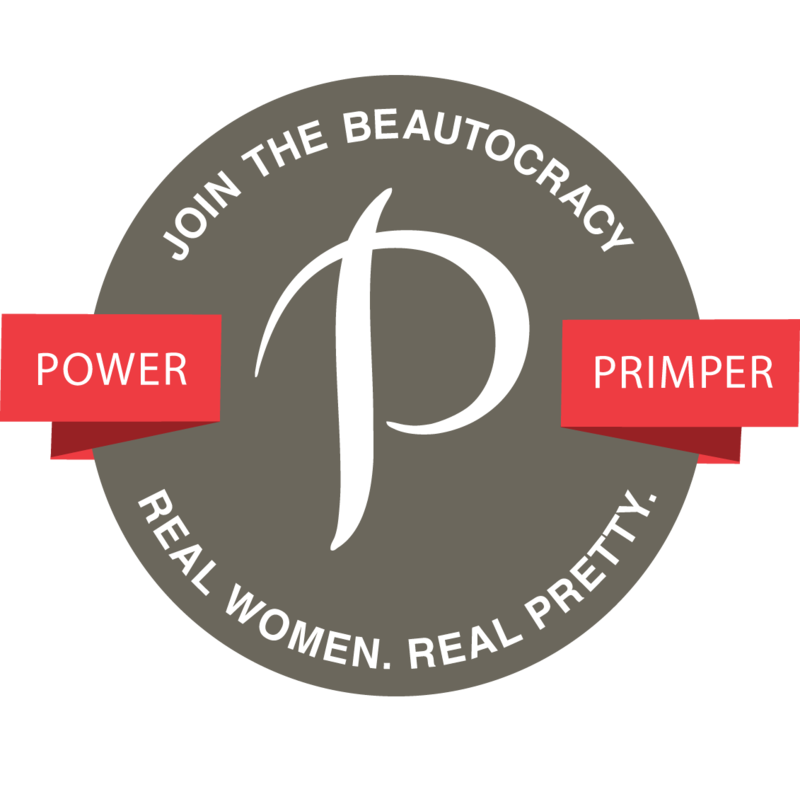 It’s definitely since been a staple in my skincare regimen. As mentioned in my previous review of the sonic brush cleansing system, I’m a huge fan of the antimicrobial brush heads. That one characteristic of the Soniclear Elite Tangerine Dream has help aid in breakout-free, clear, smooth, and more radiant skin. The Soniclear Elite combined with my favorite cleanser does a good job of making sure any makeup residue my makeup remover didn’t catch is gone. Michael Todd is premiering their Soniclear Elite Deluxe on EVINE Live and evine.com featuring a special Michael Todd Today’s Top Value – EVINE Live’s best value of the day! If you aren’t familiar with the Soniclear Elite, it will refresh and revive the look of tired skin with its sonic-powered, antimicrobial brush heads. The complete body, pedi and face system with an optional C-Boost™ Technology mode, make this “youth machine” the go-to cleansing and exfoliating tool for all skin types. Especially suited for aging skin to slough off dead dulling skin cells while deep cleaning the pores of dirt and makeup for a refreshed appearance and a more radiant complexion. This special price is good for a limited time through 9:59pm ET 11/4/15. Michael Todd is premiering their Soniclear Elite Deluxe on EVINE Live and evine.com on 11/3 at 10pm and 11pm ET and 11/4 at 4am, 5am, 6am, 10am, 2pm and 7pm ET. Tune in to watch the show live on evine.com or find EVINE Live on your local station. You can also BUY IT NOW or shop all Michael Todd products on EVINE Live. Get Social with Michael Todd and EVINELive! 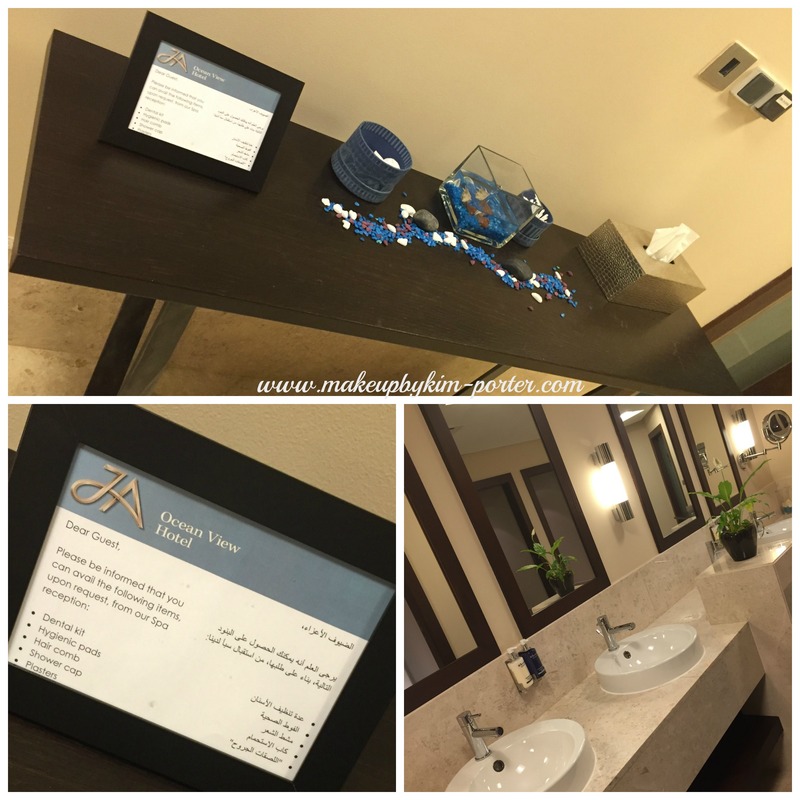 My family and I spent the first two nights of our stay in the Emirate of Dubai at the four-star JA Ocean View Hotel located on The Walk, Jumeirah Beach Residences (JBR). During our stay my husband sneakily set up a 1-hour aromatherapy massage session at the hotel’s in-house spa, the Calm Spa. The JA Ocean View Hotel Calm Spa is located on the third level of the 25-floor hotel. After being greeted and checked-in at the front desk, the gym is the first visible area once inside the spa. There were no visible signs showcasing the location of the changing room, fortunately I was guided there directly by the front desk clerk. Without her, I would have been lost. Once inside, I was shown my assigned locker, and was provided instructions on what to do in order to prepare for my aromatherapy massage. I undressed, and put on their white robe and terry slippers, and was led into a one of the most relaxing waiting rooms where I could lie down and rest or read any of the available magazines they provided. 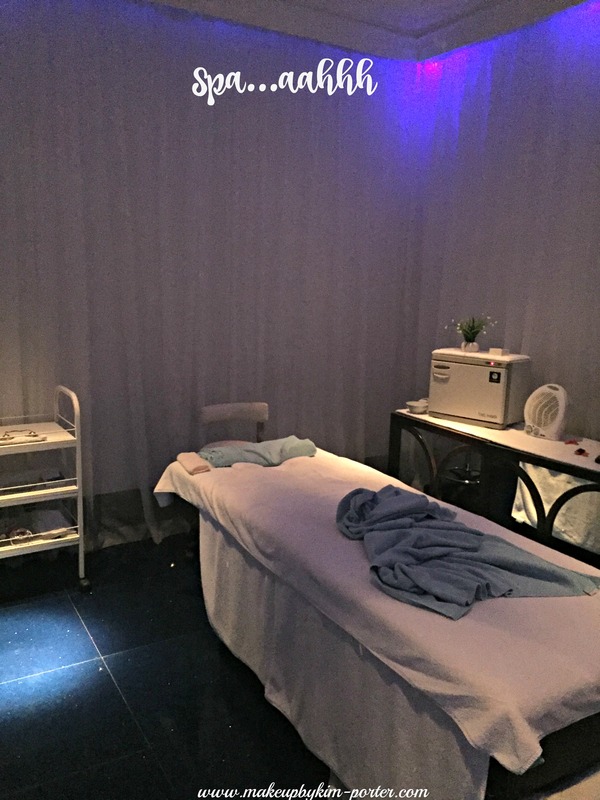 Once my masseuse was ready for me, she whisked me away into the treatment room. Calming mood lighting, and a fluffy treatment bed all set to the rhythmic waves of relaxing melodies made for the perfect spa setting. I knew I was in for a much-needed hour of pure relaxation. My massage therapist spent the most time massaging my upper back, where the majority of my knots reside. For some reason, that’s where I tend to carry my stress. As she rubbed, gently I could feel the knots melting away, and my stress right along with it. At the end of the session, I was sad it was over. I wanted to lie there at least for another hour. Overall, I enjoyed my aromatherapy massage session at the JA Ocean View Hotel Calm Spa. 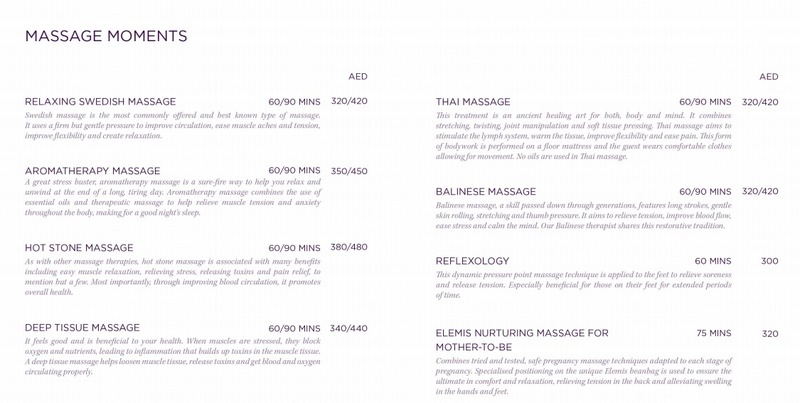 The next time you’re visiting Dubai, be sure to check out the Calm Spa. 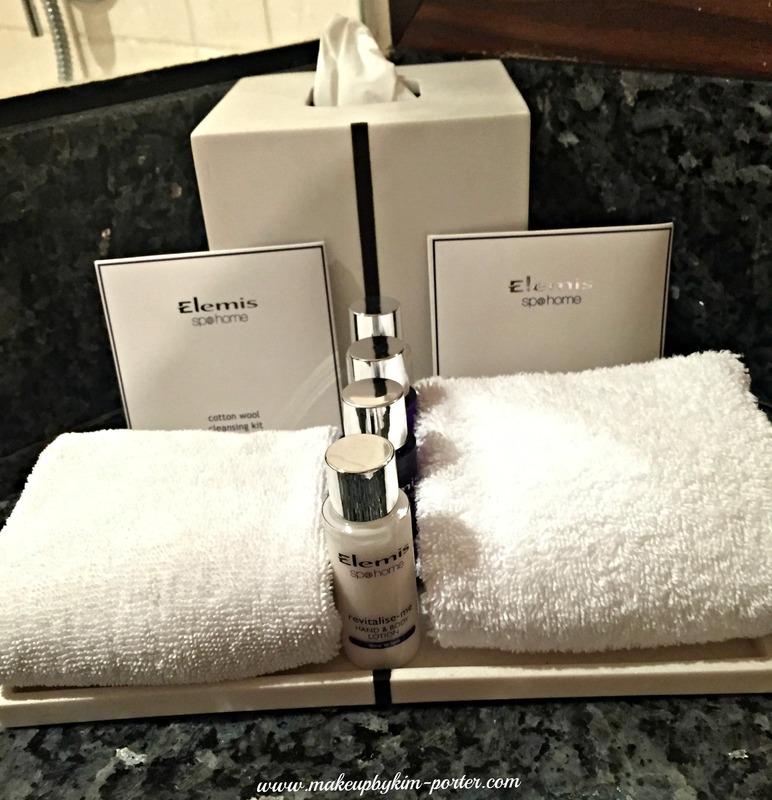 The JA Ocean View Hotel Calm Spa partner with Elemis; therefore, Elemis products are used in the spa, and are provided in guest rooms. All spa treatments include complimentary use of the wet facilities and relaxation area. Outside guests are also able to book spa and salon treatments at the Calm Spa. A detailed review of the JA Ocean View Hotel can be found over on Beauty and the Bump.